Lathes are designed to rotate a piece of wood in a controlled manner. This requires stability in the lathe to prevent undue vibration and, generally, all the parts correctly proportioned so that they work together as a complete unit. This is true of the mini lathes through to the hulking great giants with a massive turning capacity. Just look at the old-style pattern makers' lathes. Magma, a tool retail company in Austria, is renowned for selling quality tools. Their catalogue is stylish and one of the best I have seen, and they have recently introduced a range of lathes, the Series 1 and 2. My first impression of these lathes was that they are typically European, unsurprisingly, as it is made in the EU. By that I mean they are massively built, with lots of heavy castings; no-nonsense lathes, where everything has been considered, evaluated and then made to a higher spec than anticipated to make sure that they can cope with everything that can be chucked at them. That includes ham-fisted turners like me. 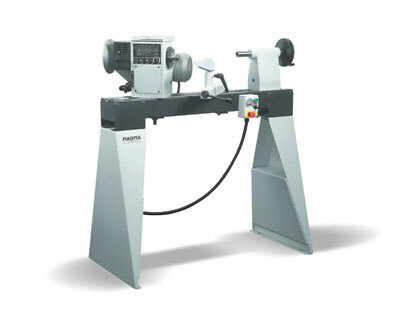 The Series 2 lathes have the bigger capacity and heavier fabricated stand. The Series 2 is variable speed and has (via a belt change) three speed ranges to choose from and has a moveable speed control console, so you can move it where you choose for maximum safety and ease of access. These have been developed for the turner who turns a lot and a variety of projects. The lathe has a 1m between-centre capacity, so you can turn chair and table legs, spindles and balusters, and a 450mm (8in) diameter capacity is more than suitable for bowls, platters and hollow forms. The spindle is the European standard of 33.3.5 and both spindle and tailstock are 2MT, both being hollow for lamp boring. The variable speed is excellent, allowing micro adjustments. Three belts provide three defined speed changes and changing the belt position is quick and simple via a quick release handle, lift the motor, move the belt, and retighten the motor. No fuss, simple and effective. The levers, handles and hand wheels are all heavy-duty versions, I don't mean that in "marketing speak", they are good quality ones that will take punishment and abuse. 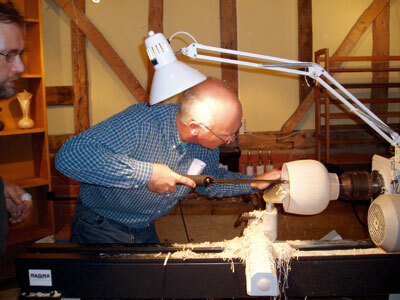 The lathe in use is at the top end of stability. It is a solid lathe and by default is better at dampening vibration that a lathe half its weight. The adage that usually holds true is the more weight in the lathe the less vibration you get, This lathe really is very simple to operate. The micro adjustments possible in the variable speed makes out-of-balance work a breeze to turn, and the solidity of the lathe is great for both large and small work. I am sure that they have based this on a pattern-makers lathe, from a design point of view. I liked the weight and mass of this lathe. The price tag of £2900 certainly places this in the high end of the lathe price bracket and will no doubt limit the market for it. That said, for those that can afford it, it is, in my opinion, well worth it. It is a well-built lathe, which oozes build quality. We will revisit this lathe, along with some other well known lathes featured in this magazine in the past for long term tests/evaluations. "It is a well-built lathe, which oozes build quality"